Sherlock Holmes was always a modern man - it's the world that got old. Now he's back as he should be: edgy, contemporary, difficult and dangerous, with award-winning Benedict Cumberbatch as the lead and Martin Freeman as Watson by his side. Sherlock Holmes can tell a software designer by his tie and an airline pilot by his thumb. He has a unique analytical brain and, unlike anyone else in the world, he staves off boredom by solving crimes. When a chance encounter brings soldier John Watson into Sherlocks life, its apparent the two men couldnt be more different, but Sherlocks intellect coupled with Johns pragmatism soon forge an unbreakable alliance. Sherlock and John’s double act is put to the test when John falls in love with Mary Morstan. She’s sensible, quick-witted and not at all taken in by Sherlock’s posturing. With the demise of Moriarty, Sherlock finds himself locked in another mind battle with the powerful Charles Augustus Magnussen, who is holding the secrets of the world at his fingertips. Once again, the game is on for Sherlock and John in The Empty Hearse, The Sign of Three and finally, His Last Vow. The 'Sherlock Series 1-3' competition has now closed. Winners will be announced shortly. Competition opens at 6:30pm AEDT on Sunday 23rd November 2014 and closes at 11:59pm AEDT on Sunday 30th November 2014. Five winners will be chosen at random on Monday 1st December 2014. To successfully win, entrants must fulfil the above entry conditions before the time the competition closes. Current members/followers are eligible to enter the competition. Only one entry per person. Only one winner per household. To be a valid winner, the entrant must not have won a prize from SWITCH within the last 28 days. 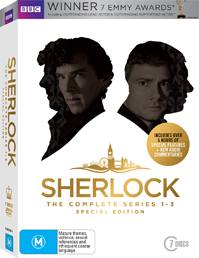 Each winner will receive one Blu-ray copy of 'Sherlock Series 1-3'. By entering, you agree to receive occasional emails from SWITCH in the future. If you decide to unsubscribe from these updates, any further entries will not be applicable. Only Australian residents are eligible to enter. 'Sherlock Series 1-3' is available on Blu-ray and DVD on Wednesday the 26th November 2014 from Roadshow.